In the early part of September, 1944, the XII Corps, under the command of Gen. Manton Eddy, consisting of the 80th division on the left, 4th Armored Division in the center, and the 35th Division on the right, had advanced eastward toward Nancy, and now faced increasingly stubborn German resistance along the Mosell River and extending southeast of Nancy to Luneville along the Meurthe River. This newly established German line of defense was defended by the German 553rd Volksgrenadier Division and Ten. Elms’ 15th Panzer Grenadier Division. The Third Army’s blitz across France had slowed for lack of gasoline and shortage of ammunition and supplies. Gen. Patton’s advance with this Third Army was being limited to short offensive operations and by German counter-attacks, both actual and threatened. Together with the 4th Armored Division, the 35th Division, on September 11th and 12th had forced a crossing of the Muerthe River about five miles southeast of Nancy and on into Dombasle, pursuing the slowly withdrawing German defenders. North of Nancy, the 80th Division had crossed the Mosell River and together the 80th and 35th Divisions were preparing to close a noose around the East of the city. Meanwhile, a task force under command of our Assistant Division Commander, Gen. E.B. Sebree, had been formed with the 134th Infantry Regiment and the 319th Regiment of the 80th Division, and several 35th supporting units. 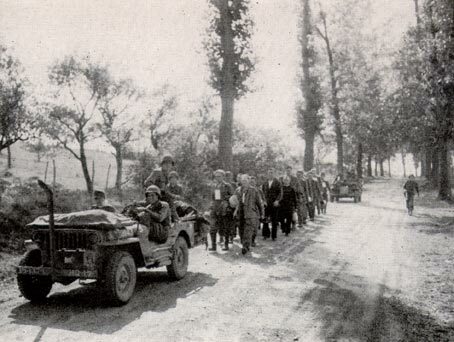 On September 15th, this task force entered Nancy, one day after the Germans had slipped away. An aerial bombardment of Nancy had been ordered for September 15th, but timely reports to our G-2, Lt. Col. John Hoyne of the German evacuation during the night, forwarded to the Air Force Commander, resulted in the bombing attack being cancelled and Nancy, the sixth largest city in France, and known as the “Paris of the East” was spared destruction, and became the headquarters of the Third Army (established in Stanislas Square) and the chief bridgehead for the main army supply lines leading into Lorraine. Too much credit cannot be given to the French intelligence groups and their commanders such as Major Crinon and Capt. Roget Senzig, who infiltrated the German lines, cut communication lines, and brought back invaluable information on enemy plans and movements, at great risk to themselves. The capture of Nancy on September 15, 1944, marked the beginning of what the army later officially called the “Rhineland Campaign” and which battle was to extend to March 21, 1945. The XV Corps, under Gen. Wade Haislip, which had been held on the Atlantic coast to contain the German troops stationed there, had now arrived with their 79th Infantry Division and the 2nd French Armored Division, and took over the responsibility that the 35th Division had been given to protect the right flank of the Third Army. This permitted the 35th Division to turn North and sweep up the area to the East of Nancy, contact the 80th Division, close the noose around Nancy, and withstand the German counter-attacks directed at the city. The XXth Corps, under command of Gen. Walton Walker, was given the assignment by Gen. Patton to begin an attack against the fortified city of Metz, using the 2nd, 5th ,90th Division and the 7th Armored Division. On September 7th they began a bloody operation of assaults on fortified positions that didn’t end until November 22nd.